GoAnywhere MFT connects to a wide variety of servers for secure server-to-server file transfers. These connections are made over the TCP/IP network using standard protocols. No additional software components need to be installed on any servers to which GoAnywhere MFT connects. This centralized non-evasive solution allows you to save significant licensing fees and have a single point of control and administration. Files can be uploaded and downloaded from Amazon S3 buckets through automated workflows. Amazon S3 buckets can also be used as storage locations for trading partner files. 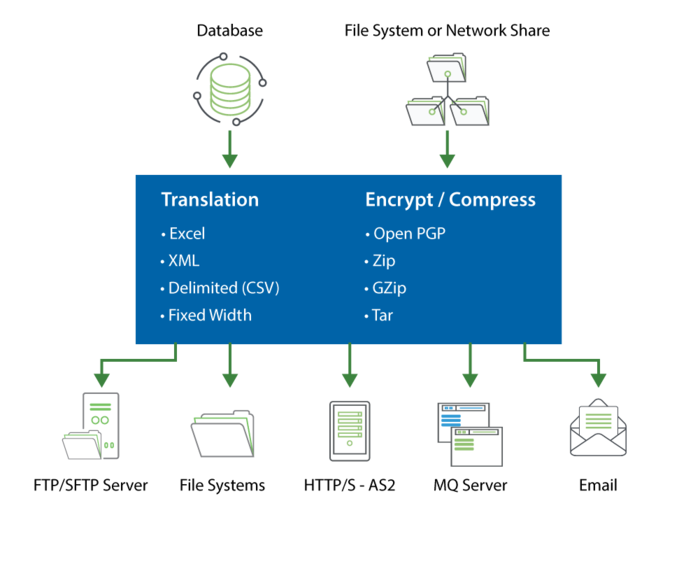 AS2 messages can be compressed, signed, encrypted and sent over an SSL tunnel making AS2 a very secure option for transferring files. AS2 also implements MDNs (receipts) to ensure the delivery of the messages. Azure Blob Storage provides organizations with affordable and scalable cloud storage provided by Microsoft. GoAnywhere supports Block type blob storage. Projects in GoAnywhere can connect to Azure Blob Storage resources to upload, download and manage documents. Connect to a wide variety of database servers including SQL Server, Oracle, MySQL, MariaDB, IBM i, DB2, PostgreSQL, Derby and Informix. Transfer files with standard FTP servers. Transfer files with secure FTPS (FTP over SSL) servers. Connect to both standard HTTP servers and secure HTTPS servers using SSL/TLS to automate web services and other web site transactions. Integrate with antivirus solutions to prevent viruses and malware from entering the organization. ICAP can also be used to integrate with Data Loss Prevention (DLP) solutions to stay compliant by not allowing sensitive information to be sent to unauthorized parties. Send accelerated file transfers between GoAnywhere servers using the proprietary GoFast protocol. Send and receive emails using SMTP, POP3, and IMAP. Integrate with Websphere MQ, SonicMQ, and other popular MQ servers for application-to-application messaging. Execute commands and scripts on Linux, Windows, IBM i, and other operating systems. SSH commands can also be sent to SSH enabled servers to perform software upgrades, system actions, and more automatically. Share files and folders on a network using the native operating system actions or with the SMB/CIFS client. Transfer files with PeSIT (Protocol d’Echanges pour un Systeme Interbancaire de Telecompensation) servers. Transfer files with SCP (Secure Copy) servers. Upload and download files using SFTP (SSH File Transfer Protocol) for securing server-to-server file transfers sent between you, your trading partners, and enterprise servers. Send SMS text messages through popular 3rd party SMS gateways services using Projects. Send traps from Projects to an SNMP server for event notifications. GoAnywhere can connect to a web server or web share using the Web Distributed Authoring and Versioning (WebDAV) protocol. Projects in GoAnywhere can also connect to WebDAV resources to upload, download and manage documents. GoAnywhere MFT can distribute data from any server listed above to other servers in your network or to external trading partners. 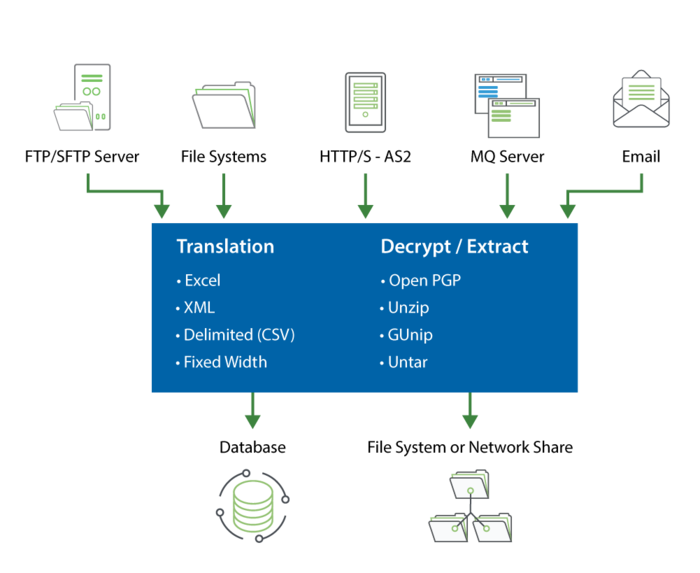 The following diagram illustrates how GoAnywhere MFT can retrieve data from any source location and pull it into your organization for storage and further processing.